"Survival of the Weakest." What an oxymoron, right? I mean, we have all been conditioned to believe that only the strong survive. That survival is for the "fittest. "; and in many cases, that thinking is correct. But today, I want to challenge your thinking and invite you to take a journey with me into this notion of the weakest survive. What does it mean to be weak? According to Dictionary.com, "weak" is defined as: "not strong; liable to yield, break, or collapse under pressure or strain; fragile; frail." Conversely, "strong" is defined on Google as “having the power to move heavy weights or perform other physically demanding tasks; able to withstand great force or pressure." So now that we have our definitions, let's get to our story. I never considered myself to be weak. I mean, I was a pretty much a success story by most accounts (even with my personal challenges): I had overcome the social stigma of being born to unwed teens from strict Christian families; was raised by my maternal grandparents in the 'hood before it was a "thing;" always had above-average intelligence which reflected itself in my academic career; achieved respectable professional success – I was on top! I was a respected leader among my peers in every group I belonged to, and I had just enough faith – or so I thought. The only thing I seemed to be unlucky at was love (although I had no trouble replacing them…). It seemed like I constantly chose wrong and with each wrong choice, I lost a little bit more of myself. Fast forward to age 40 – two failed marriages behind me, two kids (one from each), and I meet the proverbial "man of my dreams." For a while, it seems like the stars had all aligned and I would be… happy. Then one by one, the pieces of my carefully constructed life began to come undone. First up was trouble on the job. A job I had since I was 25… Eventually, I found myself jobless in July 2013 after 16 years. Next up was trouble in paradise. Rampant infidelity entered the picture and I was devastated. The two blows together were literally almost unbearable. All my old wounds of rejection and abandonment bubbled to the surface and I was crippled. I spent most days in a cycle of crying, sleeping, and drinking. Eventually, severe depression settled in, along with high blood pressure, weight gain and hair loss. I felt stuck, without a job, what could I do? I felt trapped in my own private hell. And the worst part was that no one knew. I played the public trophy girlfriend but life at home was hell. I questioned everything I knew about myself and my life choices. A year and a half in, I decided I had to re-ground myself, so I turned back to my faith, hard. I began to drop people and activities and focus inward, trying to find myself again. It was now the beginning of 2015. Things continued to go from bad to worse, financially and personally. I felt as if the world was spinning out of control and I was hanging on for dear life. Hanging on was all I could do. I was a shell of the person I normally was – sad all the time, crying at the drop of a hat, hollow eyes, hair falling out in patches, drinking heavily at times and the weight gain. Friends and family kept say "leave," but to go where? Finally, it looked like we would have a fresh start, but then at the 11th hour, he announced that he was not continuing the next phase of the journey with me. The bottom had truly fallen out as we had just signed a new lease to begin less than a week after this announcement. I still had no job, so I didn't know what I was going to do – how I was going to pay rent or take care of my kids. All I could do was cry as we set about the task of deconstructing the life we had been building for the last four-plus years. The day that changed everything? September 9, 2015. I was spiraling out of control. At one of my good friend's suggestions, I decided to talk to someone, and I reached out to the Pastoral Care Pastor at my church. She saw me immediately, and when I entered her office, she could see and feel my defeat. I shared everything with her (even the embarrassing stuff about shacking up in the first place) and she, in turn, shared some of her story with me (even the embarrassing stuff). I was amazed that a stranger would do that. She then shared her successes, after what seemed like insurmountable odds. She agreed that I had lost a lot, but assured me that God would never bring me this far to leave me. We talked about depression and suicide, two very real things I was facing at my weakest points, and I promised that I wouldn't do that. She then gave me some ideas for generating income that I hadn't thought of (sometimes you need an outsider's perspective) and I was grateful. She then prayed for me and I left with hope. Not a lot, but a little. I went home to continue packing and going through the motions. I had a second appointment with her a few days later, and I could report some positive updates. Through her, my church came to my financial aid at a time when I really had nothing and nowhere to turn (my parents were unable to help me). She also personally took me by the hand that following Sunday and introduced me to people at my church and got me signed up with a ministry to work with. Approximately a month later, I had a phone interview to do consulting work with a firm and I got hired the next day. From October 2015 (coincidentally almost a month to the day that I moved away from my "dream man") until I started my new job in mid-June 2017, I had steady project work for the most part. Me and "him" officially parted ways in November 2015 (after some painful attempts at trying to maintain the relationship). I still live in the place that my kids and I moved into on a wing and a prayer back in September 2015. My kids and I endured some rough financial times and I had to turn to government help at times to get through them. Without a full-time job (and its corresponding benefits), I survived my son's senior year (prom, graduation) and got him off to college (just after starting my job), and even took a vacation last year (hadn't had one since 2007). More importantly, I found me again, a stronger version of me. I won't say that it's been easy (because it certainly hasn't been) but when I look back, I know I'm not where I used to be. I know it's not the same as people surviving illnesses and abuse (although there was some emotional abuse going on here), this is still a story of survival. Not of the fittest, but of the weakest. I'm still working hard to stabilize all that was lost over the past 4 years, and at times it's still overwhelming and challenging. But God. "But he said to me, "My grace is sufficient for you, for my power is made perfect in weakness." Therefore, I will boast more gladly about my weaknesses, so that Christ's power may rest on me. That is why, for Christ's sake, I delight in weaknesses, in insults, in hardships, in persecutions, in difficulties. For when I am weak, then I am strong." And guess what? As weak as I am, today I am at my strongest and I know that I can survive, well, ANYTHING! Darvionne Givhan, or "Darvi", as her friends call her, is an attorney, blogger and mother of two who enjoys spending her time with her family and many friends, writing, scrapbooking and enjoying life. She's a beautiful testimony to surviving the many twists and turns that life brings. I hope you find strength in her story as we all go through things that test our will. 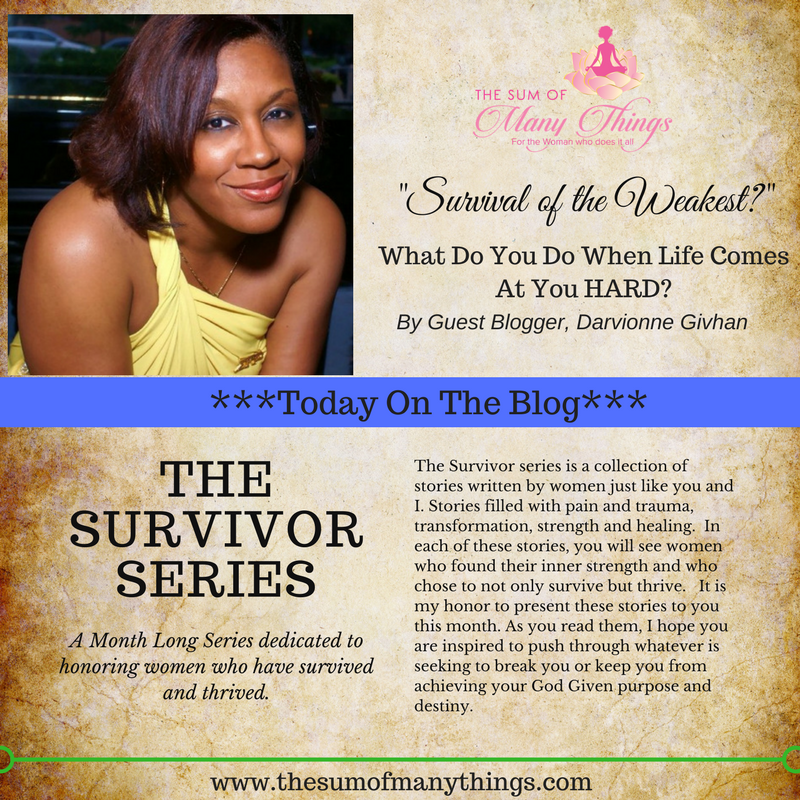 Check out Darvi's thoughts and reflections on her blog, hollaatdarvi.com! Until next time, take care of yourself and one another! Thank you for your subscription! Look forward to weekly articles, tips and tricks to help us each liveour best lives.